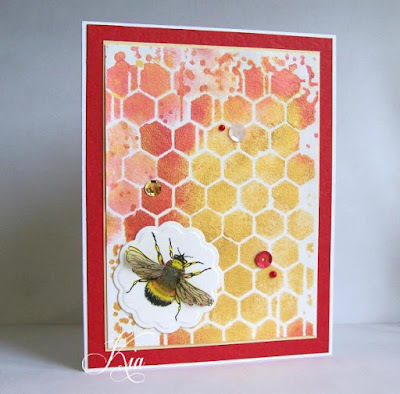 I used the negatives from dies and some beautiful blossom dies that I coloured with Chameleon Markers. 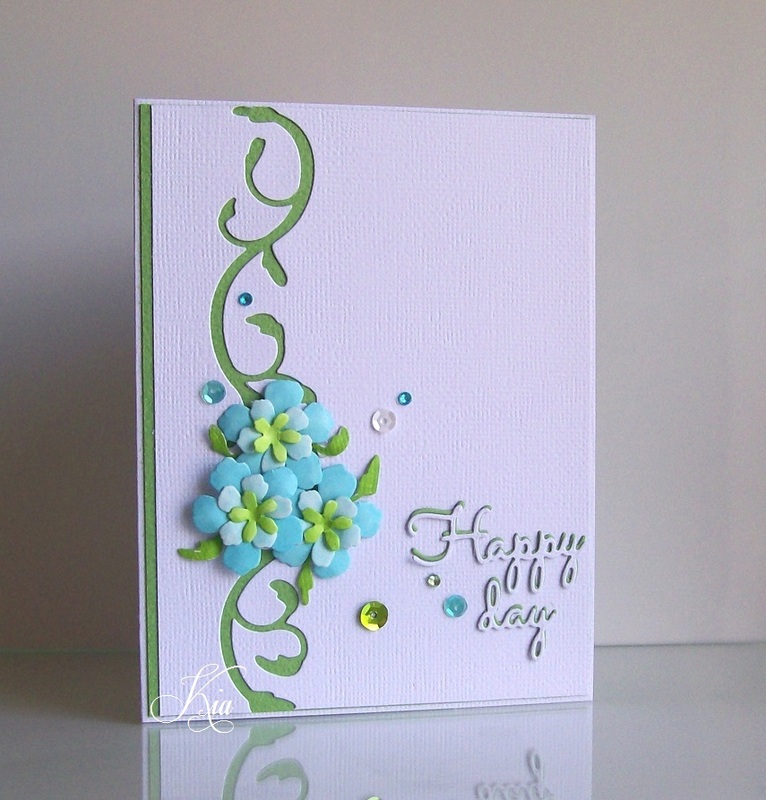 I added the sentiment, shadowed with the green and sequins and gems to finish. Again, this card could be used for any reason. 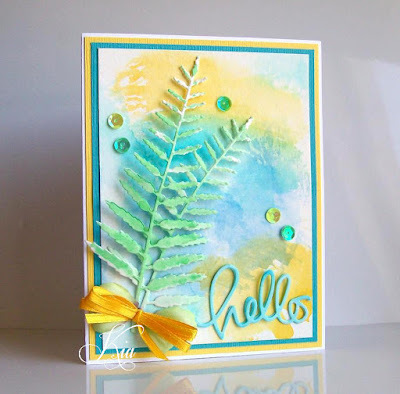 I did this for the colour challenge at splitcoaststampers. 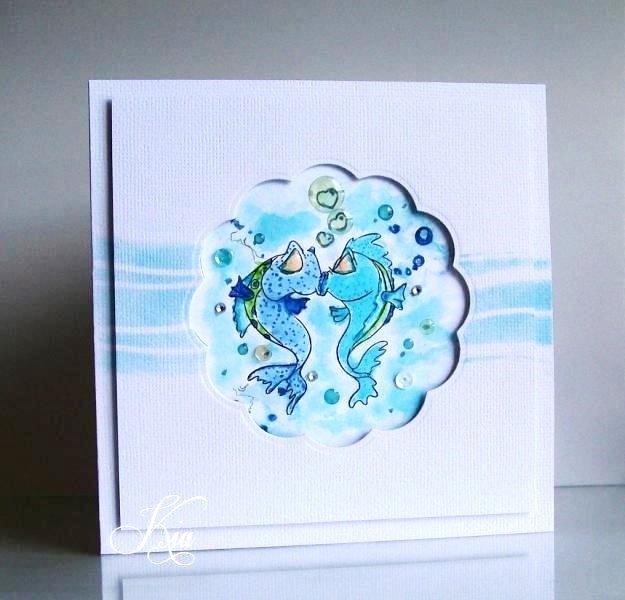 These kissing fishes make me laugh - it would make a great anniversary card. 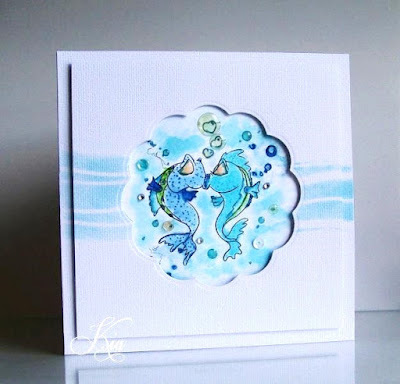 I watercoloured the fish and the background for the fishes and added elements for sparkle, and heart bubbles floating up from the kissing duo. The top panel is on foam strips to give the image depth, and a wave pattern is added on the card front for further interest. I added crystal effects to their eyes that I had coloured with copics and lined with gel pen. 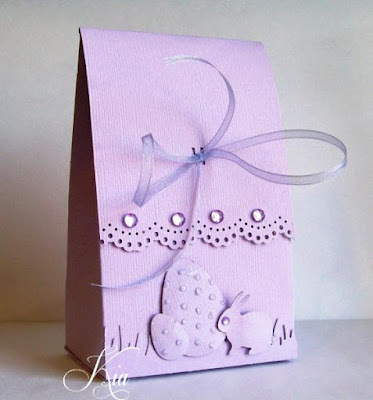 This is a Easter Bag that I made for my neighbour's dogs at Easter. 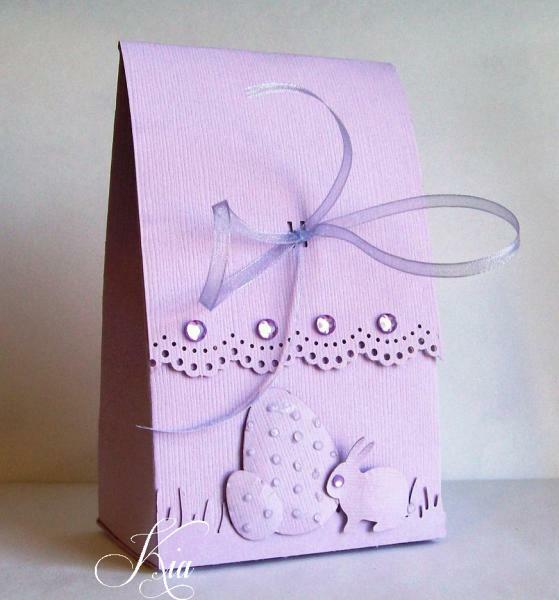 I did their card using the same colours and put on the inside of the card "Why should Bunnies have all the fun". I have made these bags before for different occasions, changing the colours and the scene on the front. I have also at times added a handle from the ribbon and made a different closure with cardstock. The lace edge is done with a punch and I have about 8 different styles. This style just happens to be my favorite. 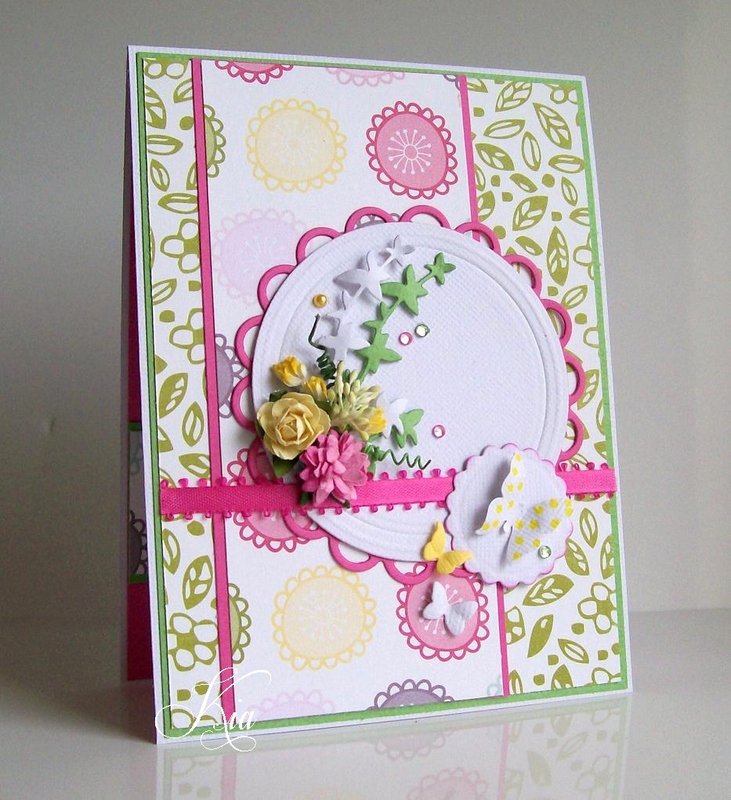 A Bucket of Posies is a happy whimsical card and I think could be used for any occasion. 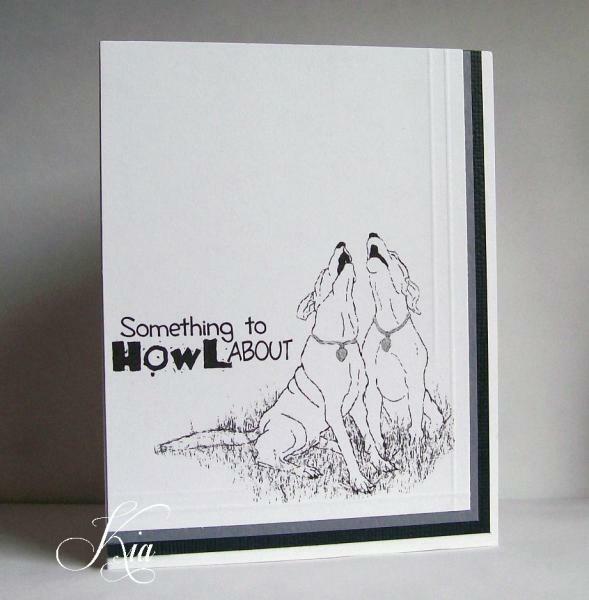 The background is embossed with a light sponge of ink swiped across, the embossed areas catches the ink. The tulips in the bucket are coloured with markers and the bucket and the posies are on foam strips allowing for the layers. The pale is die cut from a silver shimmer cardstock and attached to tall grasses for a whimsical look. The Hello die was added along with a few butterflies. Circles is what this card is about. Circles in the designer paper along with leaves in the background designer paper. 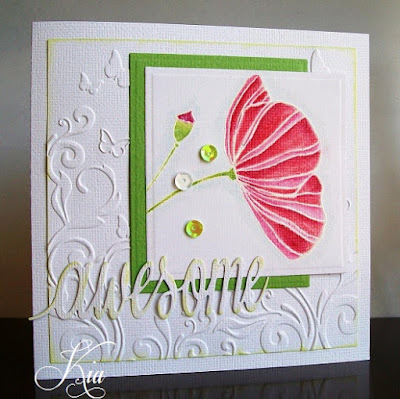 The circle die also has another circle embossed in it for dimension. 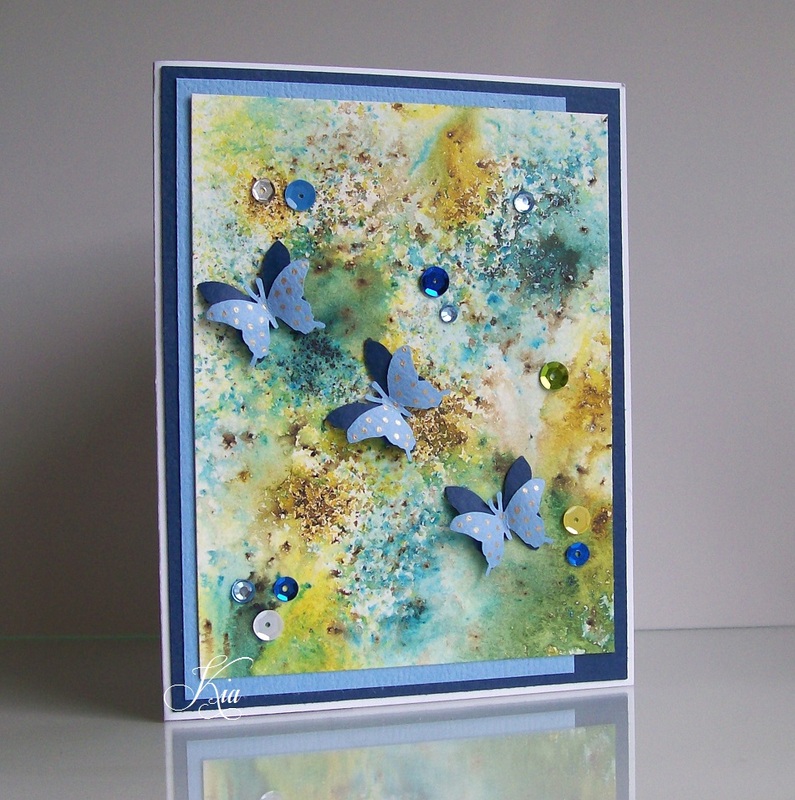 A spray of flowers added, with florists wire spirals, some gems, ribbon and a sprinkle of butterflies to finish. You can see a bit of the inside in the bottom left of the picture, just waiting for a sentiment. This is a tent fold card. This card I did for a dear friend. The technique I will explain with my next upload Butterflies in Flight. Another CAS (Clean and Simple) card to share. When I was making this card I was thinking it would be a great card to let someone know you are thinking about them. The frame is on dimensional's (foam strips) as are the vases, which have been embossed in various designs for added texture. They have been glazed with Crystal Effects Gel to give them that shine against the white embossed background. 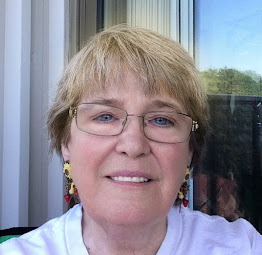 A few sequins thrown in, I love sequins and I really like the clean look. 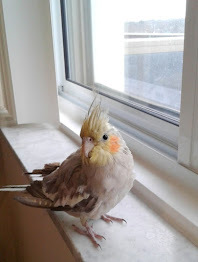 More birds!! This is my idea of the perfect Row House. 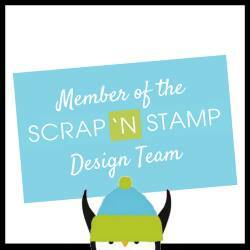 This card is made entirely from die's that have been individually cut and styled. 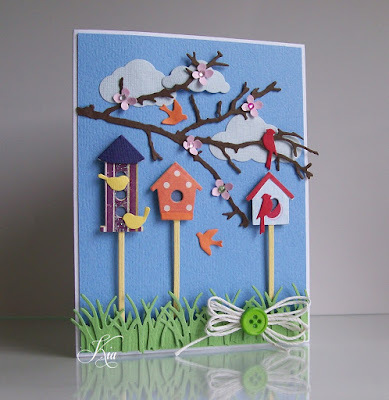 The bird houses are on foam dots, as are the grasses and a couple of the clouds. The flowers have been shaped and have gem centres. Some twine and a button to finish. 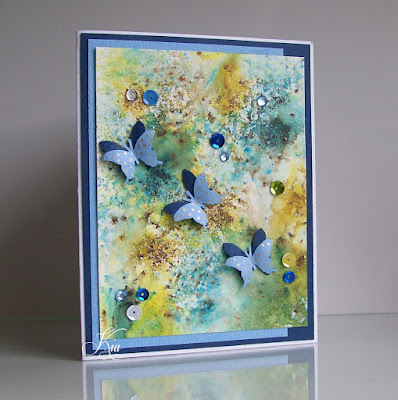 I love the colours on this card, of course I would say that, I made it!! 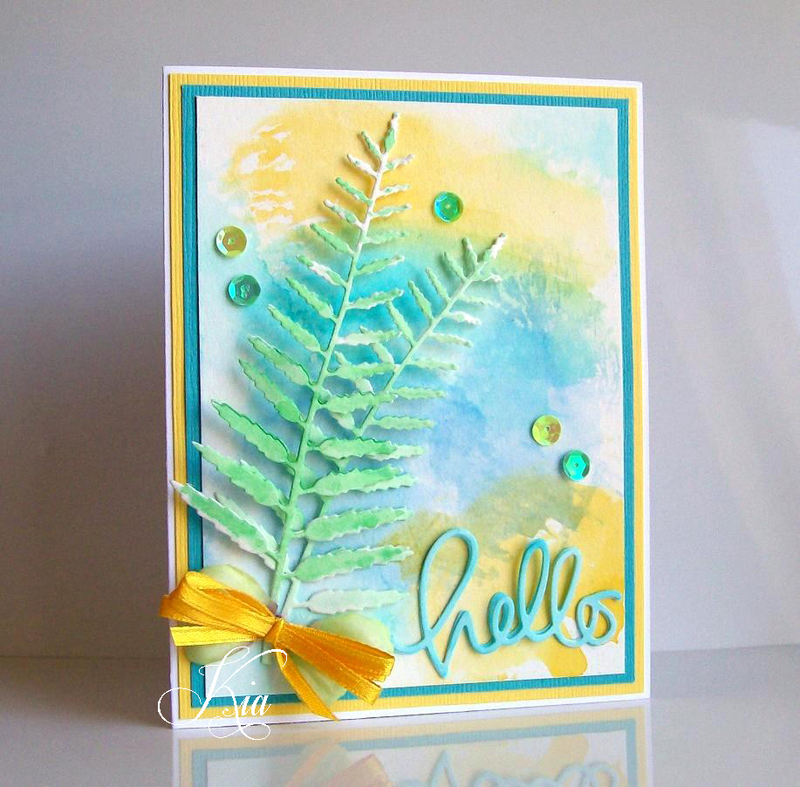 lol - the background is a watercolour background, and I used the same technique to colour the ferns and the hello sentiment, which is doubled up for dimension. There are sequins and ribbon - when I mail these kinds of cards I roll up and tad of paper towel or similar - yes, even toilet paper, and tuck it in the bows. The point is to stop the ribbon from going totally flat. This card is sold but I wanted to share it. I coloured this stamp with Prismacolor Pencils and Gamsol, which is a blending solution I really like the colours, but I would also like to watercolour this image, I think I might try that in the next few days. I embossed the background for interest and added the awesome die with some ink sponged on for highlighting. The lady was going to give it to an employee for the company she worked for to thank her for the work she was doing, so it was used for a thank you card. 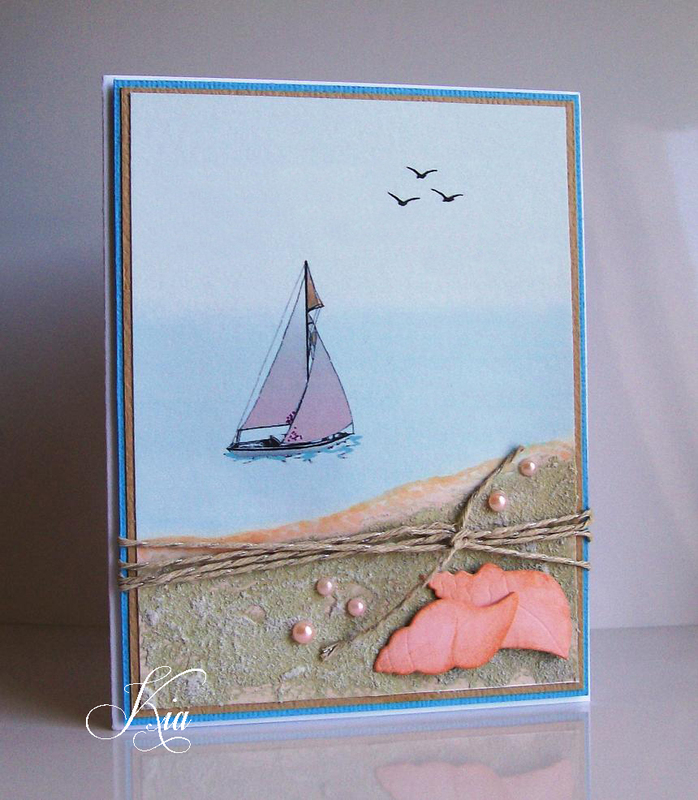 This card has me thinking of beautiful British Columbia. I used a crackle embossing folder on 2 sides to represent the ocean and mixed ink with water and sponged on. I then added some of the solid blue colour for depth. I then added a panel where I sponged on some clouds added some blue drywall tape, cheesecloth and under it all there is sand paste. 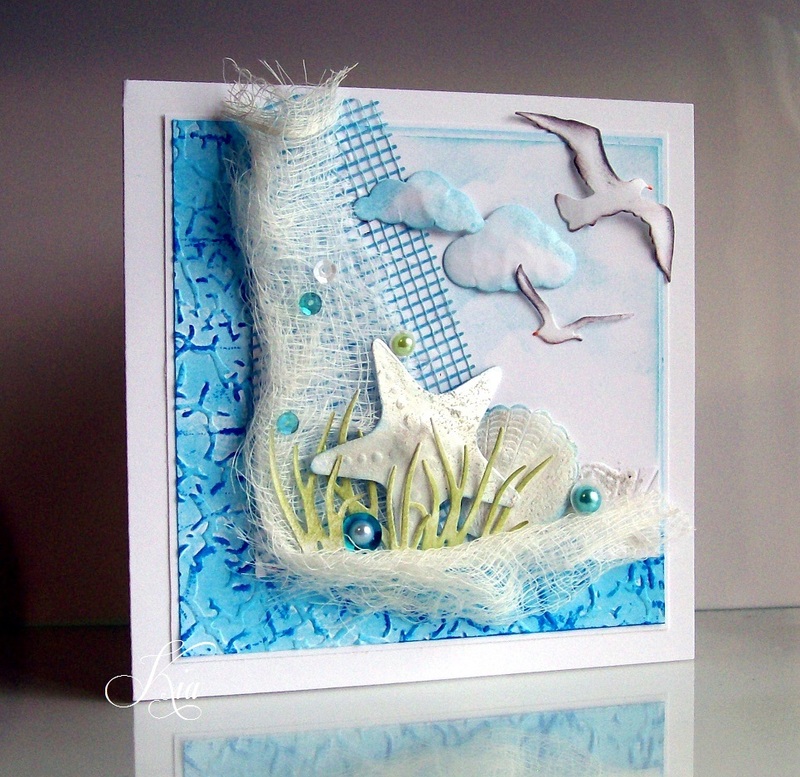 I die cut the shells and sponged on some light blue ink then rubbed on platinum pearl paste for the shine I added some sea grasses, sequins with pearls inserted, a few clouds styled and on foam dots, along with a few sea birds. There is a lot of interest in this card. This is what is referred to as a Clean and Simple, better known as CAS card. I really like to make them, but at times they can be difficult. 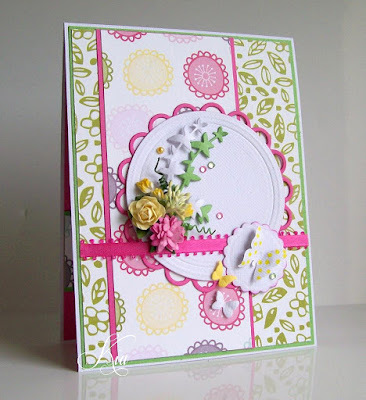 Design is very important in a CAS card and there is usually not many layers. 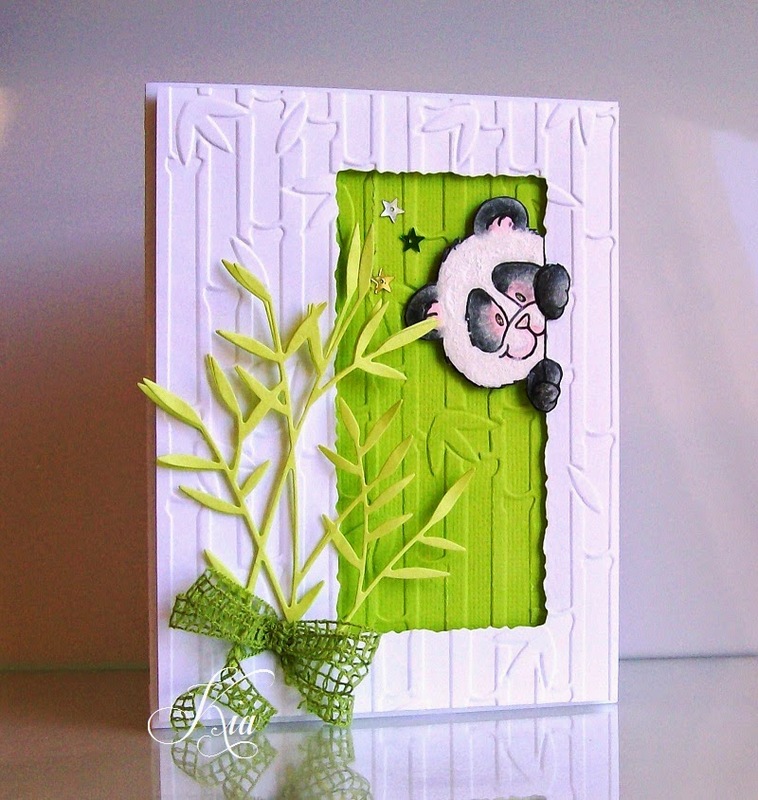 This card is made using all dies. There are the pinking circle dies cuts with the top being embossed for added texture. The birdhouses I added Chameleon Markers to for the trims and posts, a few birdies and a iron fence propped up for more dimension. A tiny "smile" sentiment finishes the card. 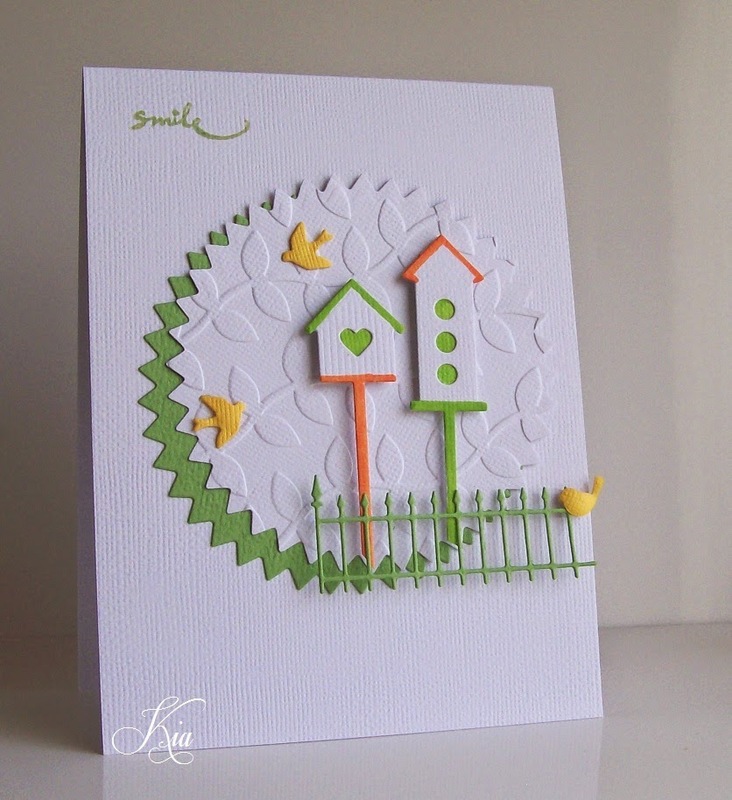 This card is sold. I was asked to make a card for a little girl who is 4 and who loves dinosaur's and, her favorite colour is purple - so a dino and purple she got. 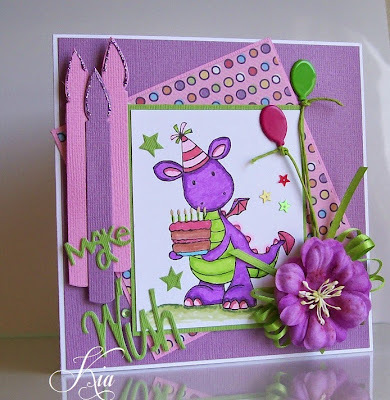 Again the dino stamp is coloured with Chameleon Markers. The candles and sentiment are die cuts and I added a crystal gem to the Wish to dot the i, and stickles to the flame of the candles which are on foam dots. There are layers of designer paper and cardstock at angles for interest and some balloon brads that I sewed on some twine for the string. I made a bow with the green ribbon and added a big floppy purple flower over the top and a few stars, because she is the star. A lot for a little girl to look at and amuse her. 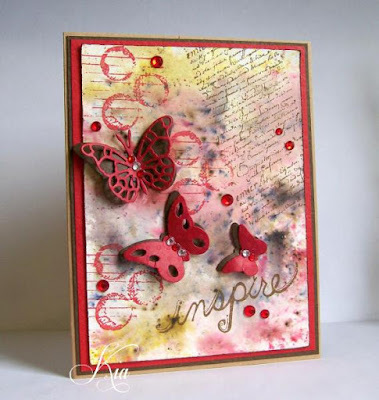 I made this card for a Inspiration Challenge where we were sent to this Pinterest Board. I was amazed at what I saw. In any event, I picked this image for my inspiration piece. Barbie Dolls were not my thing when I was young, my Mother felt they were too voluptuous for young girls. In any event, the clothes on that Barbie are pretty for a young girl - pinks, greens - fun colours. So fun it was, with the flirty Flamingo. The card is double matted and the third layer is embossed with flamingo's and a few coloured for interest. 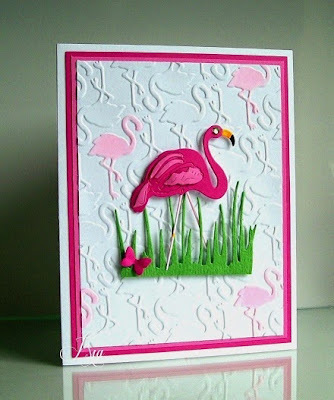 The Flamingo front and centre is a die, she is on foam dots and styled to show off her shapes. A grass border and a lone butterfly looks on. I had so much fun making this card which I did for a challenge on Splitcoaststampers. The diamond background is made from two different colours of inks, a green and a mustard shade. Once I had finished the diamond background I then cut the negative shape of the strawberry die in my background and then cut two other shapes and coloured using Chameleon Markers. I inserted one of the coloured images into the cut shape of the diamond background, then styled the other shape and adhered over top so there is much depth to this card. 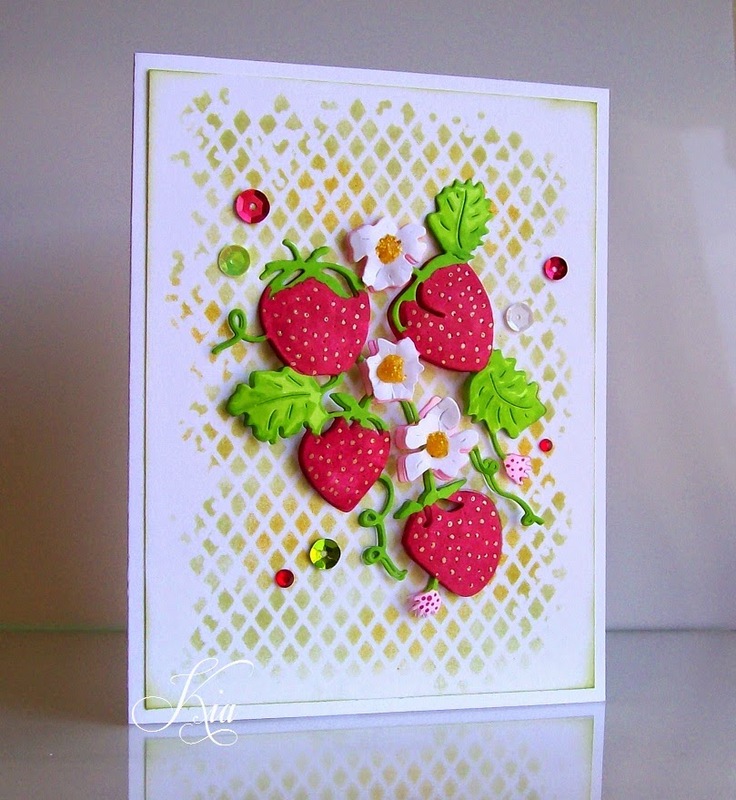 I added bronze glitter pen to the strawberries for the seeds. 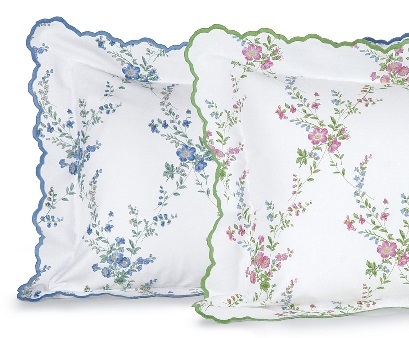 I did cut extra flowers and styled and added to my design, and added a product known as Stickles to the flower centers. 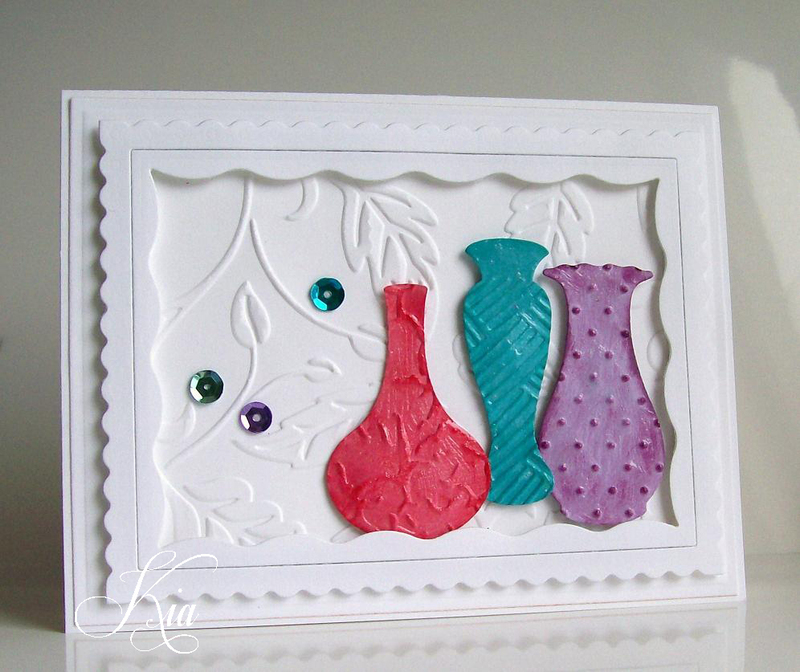 A few sequins and crystal gems finished my card. I was inspired by all the storms Southern Ontario has had in the last couple of days. The background raindrops come from a designer paper series. 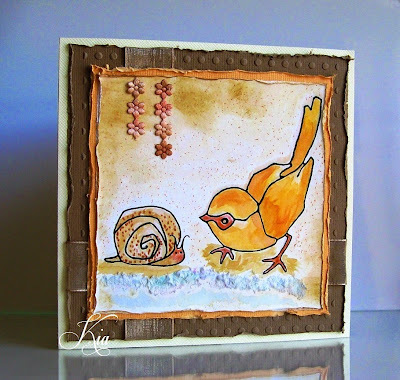 The image is hand painted with Chameleon Markers which adds wonderful hues of bursting colour. 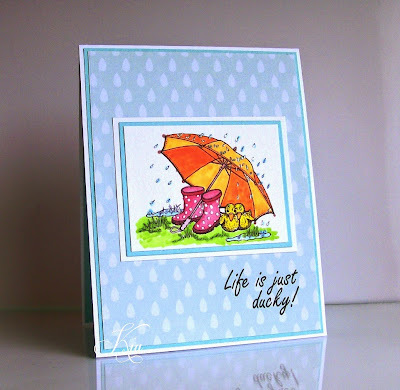 The raindrops on the image also have Crystal Effects on them, which when you see in real life, adds shine to the drops. The image is triple matted, and matting is added to the designer paper. The shape is a tent fold. I added the sentiment which I made in Photoshop.